The governor wants money from SAIF, the kicker, capital gains and estate taxes—and public employees—to halt rising employer contributions. Gov. Kate Brown today released her plan for halting the rise in the cost of the Public Employee Retirement System costs for Oregon schools, community colleges and public universities. The governor’s concept calls for the state to set aside $2.5 to $3 billion to hold employer rates steady. That sum would be front-end loaded with an $800 million down payment but the rest of the money could flow in over the next 14 years. Brown proposes to pull together several different pots of money to use to pay down some of the obligations school districts and other educational institutions owe to current and future retirees. Part of the plan that is sure to draw howls from her union base is a proposal that public employees shoulder part of the cost. The governor’s proposal comes at an opportune time. Last week, lawmakers offered Oregonians an idea of how they would deploy $2 billion in new revenue for K-12 education. Not coincidentally, former Gov. Ted Kulongoski and his one-time chief of staff, the former labor lead Tim Nesbitt, rolled out plans for two 2020 ballot measures that would cut the public employee pension costs that threaten to consume much of the proposed new tax increases. Public employee unions don’t like those ballot measures, which would bite more deeply into the compensation of current employees than would Brown’s proposal and begin a transition away from a defined benefit plan, where the state is on the hook for future payments, to a 401K-style plan, where the employee takes more of the risk. Brown said she does not favor adopting a 401K-style plan. 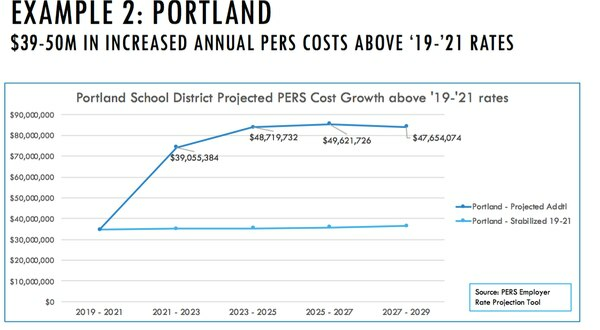 The governor’s position is that if nothing is done, the rising cost of pension obligations will consume much of any new funding for teachers and educational services. In 15 years, according to state projections, system costs will decline sharply as the retirees with the most generous benefits (so called Tier One members, hired before Jan. 1, 1996) are replaced by retirees with more modest benefits (Tier Three members, hired after Aug. 28, 2003). If nothing is done, employer contribution rates for school districts, for instance, are set to rise sharply to help pay down the current nearly $27 billion unfunded liability. The problem—now a $26 billion unfunded liablity—is that lawmakers promised retirees more money than the state has set aside to pay them, so employers have to increase their contributions to catch up. Brown’s plan begins with $800 million dedicated to the shortfall up front, then roughly $2 billion more over the next 14 years. 1. Retaining $400 million from an individual income tax “kicker” scheduled to be returned to taxpayers. 2. Transferring some or all of $486 million in excess reserves held by SAIF Corp., the state-owned worker’s compensation insurer. Keeping the kicker would require a two-thirds vote of both legislative chambers and would likely anger many taxpayers and Republicans in particular. Brown says it makes no sense to send a kicker back to Oregonians when PERS has a huge deficit. “It is the height of fiscal mismanagement to on one hand say something must be done about the PERS unfunded liability, and on the other hand do nothing to stop the state from sending out over a billion dollars in tax breaks to wealthy Oregonians and businesses over the next 12 months,” she said. Sweeping money from SAIF’s reserves could anger companies that hope to benefit from those reserves in the form of lower rates or dividends from SAIF in the future. In terms of recurring sources of funding for the 14-year period, there are two major line items. One of them is relatively uncontroversial, although speculative; the other will cause conflict with public employees. 1. The first is windfall tax revenues. State economists project that revenues from capital gains and estate taxes are likely to be far above normal over the next 14 years. That line item would be the biggest source of ongoing funding for rate stabilization, bringing in nearly $100 million a year for 14 years. 2. The plan also calls for current employees to make contributions to pay down the unfunded liability. The governor’s draft plan shows that employees in Tiers One and Two would pay 3 percent of their salary above $20,000 and Tier Three employees would pay 1.5 percent above $20,000. That employee contribution would bring in about $60 million a year. Employees would pay those contributions into “stability accounts” that they would retain ownership of, in effect reducing their take-home pay now but retaining their full pension benefit. Currently, the PERS liability is about 80 percent funded. When it rises above 90 percent, employees would no longer make the new contributions. Blosser anticipates push-back on various parts of the proposal. “It’s my hope is that people will consider the whole plan—not just parts of it—and see that we are equitably spread this burden,” he says. Although many business groups have called for lawmakers and Brown to link the passage of large new corporate taxes to PERS cost containment, Blosser says Brown is not taking such a position. “The governor is not predicating her support for new taxes with the passage of some version of the PERS stabilization package she’s proposing,” Blosser says. The PERS Coalition, a group of public employee unions reacted negatively to the governor’s plan. “The proposal described today is a non-starter and lawmakers should reject it right out of the gate,” said Patty Wentz a spokeswoman for the coalition. Mike Salsgiver, the Executive Director of the Associated General Contractors, Oregon-Columbia Chapter warned in statement that SAIF’s reserves should be off limits. Brown will present testimony on her plan to lawmakers in front of the Legislature’s Capital Construction Committee at 1:30 pm today.